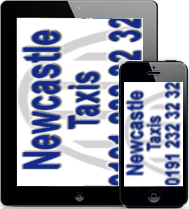 A Newcastle upon Tyne based taxi company offering professional, reliable and cost effective travel to individual and corporate clients. Our fleet of cars and mini buses can cater for upto 16 passengers, and if you have greater numbers our trading partners can cater for any number and any destination. Simply give us a call or make a Booking Enquiry online and we get back to you ASAP. Book online via our website using any device, our website will automatically scale to best fit your device making reading our website and making a booking as easy as pie. Our traffic management system automatically manages all bookings and allocates these to the most appropriate vehicle, meaning no booking ever gets missed. If you still prefer the old fashion way of making a booking then simply call one of our many telephone numbers and speak to a human.